Galco Avenger Belt Holster FREE SHIPPING! This high quality Galco Avenger holster is constructed of premium saddle leather and features a reinforced holster opening for ease of re-holstering, combat grip, stitched sight rails, open muzzle and tension screw adjustment for custom fit. The Galco Avenger holster is made exclusively for pistols. The Avenger fits belts up to 1 3/4" wide. I'm a bit disappointed that this holster doesn't fit as close to the body and my "Pancake" holster for the same pistol. However, I got it because of the "0" cant, which I needed. For that, it's great. Like ALL Galco holsters, (I have 7 others), they fit the pistols like a glove, great construction and looks fantastic. It's all you need for your carry piece. Excellent Holster by GALCO, I am well pleased. Another fine Galco Holster as always. Top quality and craftsmanship, the fit on my 1911 is perfect, very comfortable to wear and holds the pistol firm and with ease of draw. This is my 3rd holster from Galco, and I have yet to be disappointed. Super Fast Service from CopsPlus, SALUTE. 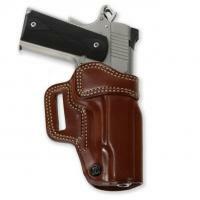 Galco makes quality holsters. This size is a bit hard to find, but CopsPlus comes through Great product, great service, all around positive experience. While not cheap, you get what you pay for and the Galco Avenger is top quality. It is a straight "up" draw with little if any cant. When carrying a heavy gun like the full-size 1911, too much cant can literally pull your gun and pants down. When you combine the Avenger with a solid top quality belt, you do not experience this problem. This holster covers the gun and protects it well. It is heavy stitched and its design keeps the weapon tucked in tight. There is plenty of space between the grip and the holster to allow for acquiring a solid purchase on the stocks while the gun is still secured in the holster itself. The welt at the mouth of the rig makes re -holstering a breeze. COPS PLUS price is about ten bucks lower than the norm for this item and they always ship quick, which is great because I am impatient. When I want something I want it yesterday. If you need the best beltconcealment holster for your heavy 1911, order this one and get it at a great price from these good folks. They will get it to you without delay. I feel this is the best holster you can buy at any price. This is my 3rd. Galco the other 2 are for my 1911 an 19 Glock and are 15 an 20 years old. And still perfect. By the way CopsPlus are very special people with price and super service thank you guys. It's a good holster, well worth the cost. One of the most comfortable holsters I have. This is my second avenger holster galco in my opinion makes some of the best leather holsters I now have one for my glock 27 and kimber 1911. Same Galco fit, same Galco quality. Will the av248 fit the Sig 229 or the Glock 22? AV248 fits full size Sig's like the P220 and P226. AV250 fits Sig Sauer P229. AV224 fits Glock 22. Is this designed for the full size M&P or the compact? Avenger belt holster is designed to fit the full size M&Ps. ©2002-2019 CopsPlus.com: Galco Avenger Belt Holster FREE SHIPPING!